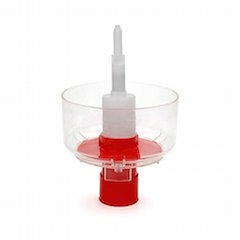 Bet Mar Liquid Hobby Shop: Bottle Rinser "Vinator"
Fits Securely On Top Of Our "Bottle Tree", Or Can Be Used Free-Standing On A Counter Top Or Table. Fill The Reservoir With Sodium Bisulfite/Water Solution. The Bottle Rinser Will Mist The Solution Into Your Wine Bottles By Pumping Up And Down With The Bottle Over The Spraying Nozzle. This Will Cause The Release Of Sanitizing Gases That Will Linger In The Bottles Making Them Sterile And Ready For Wine.